Severe flooding in the U.S. Midwest region is having a cascading effect on agricultural, food, fertilizer, and fuel related supply networks. Swollen rivers in parts of Missouri, Nebraska, Iowa and other U.S. Midwest regions after a winter that featured heavy winter snows and a late winter intense “bomb cyclone,” have led to flood devastated and transportation disruption across many parts of the region. Reports thus far indicated upwards of $3 billion in damage. Thus far, grain and crop shipments have been disrupted and farmers fear that they will not be able to conduct Spring planting on-time. Once more, additional severe storms and flooding is forecasted for the coming Spring. What remains unclear will be the effect on food prices in the coming weeks and months, along with transportation costs. 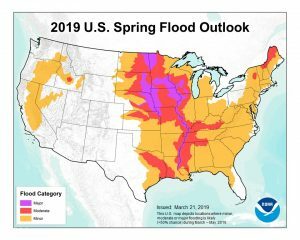 The U.S. National Oceanic and Atmospheric Association’s (NOAA) U.S. Spring Outlook now forecasts that nearly two-thirds of the Lower 48 U.S. states face an elevated risk for flooding through May, with the potential for major or moderate flooding in 25 states. The majority of the country is favored to experience above-average precipitation this spring, increasing the flood risk. According to reports, global grain trading firm Archer Daniels Midland has already cut its first-quarter profit forecast by $60 million citing disruption in current operations. Cargill indicated that had to temporarily close three of its grain elevators in Nebraska and one in Nebraska last week because of flood waters. Meat packers Tyson and Hormel each have reported disruption in operations and transportation along with added delays in moving products to markets. Rail and barge service across the region remains disrupted and some are predicting that barge traffic in the upper and lower Midwest, already significantly down, will not return to normal levels until at least May. That will once again place additional capacity demands on rail and truck capacity as well as additional costs. The region itself was already being economically impacted ty the ongoing trade and tariff war involving the U.S. and China. As we have noted in prior commentary, bankruptcy filings across the region are on the rise and optimism is shrinking as to future markets, and now, climatic-driven setbacks.